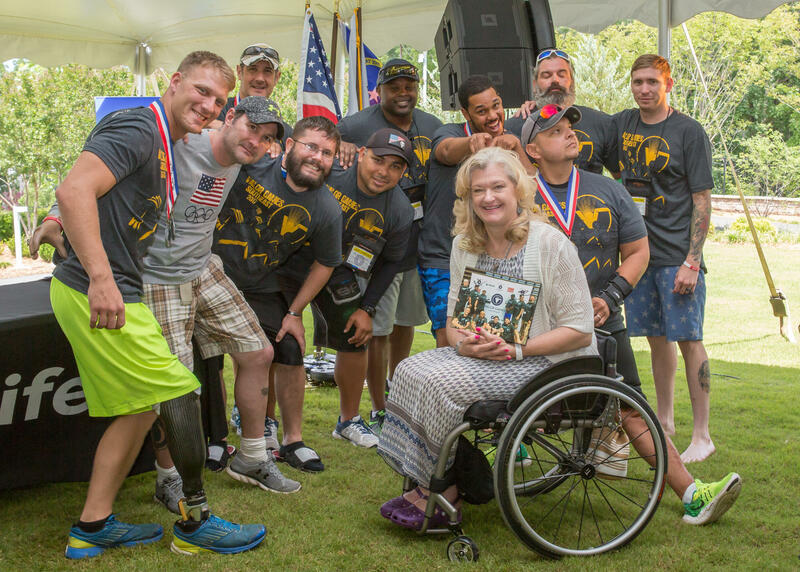 Ashley Thomas poses with participants of the 2017 Valor Games Southeast. This year's games run from May 21 - 24 throughout the Triangle. Each year the Valor Games come to the Triangle and give disabled veterans and those in the armed services the opportunity to compete in sports that help them build strength, confidence and tenacity. Meet the founder and executive director of Bridge II Sports Ashley Thomas. Ashley Thomas is the woman who helped bring the Valor Games to Durham. She is the founder and executive director of Bridge II Sports, a local non-profit geared at making sure disabled youth and adults stay physically active. For Ashley, it’s a personal mission. As a child her feet were so badly deformed she was unable to wear shoes. Her struggle with spina bifida meant that simple things like working out at a local gym were almost impossible. She remembers being denied a membership because she was considered a “high risk” client. In mid-life, Ashley was set free when she was given a wheelchair. Suddenly she was free and mobile. She no longer had to spend her energy and strength trying to walk. This is when Ashley began to imagine a different life for herself. A life where she could participate in a 5k race or kayak. Having endured over 35 surgeries, Ashley knows what it means to feel like there is no hope and options are limited. She will join host Frank Stasio to share her story, her work and her philosophy for growth and change. Join us as we Meet Ashley Thomas. At that time, in 1962, when someone was born with spina bifida the odds of them not living were significant … My parents were told to have low expectations that I would never walk and that I would be most likely – the term that they used then was retarded – and that I would basically be a vegetable and couldn’t speak. Obviously, that is not the case. My mom was pretty straight forward. There’s not a lot of nonsense sometimes with disability. And I have to say as a person being straightforward with children is probably your best answer. One of the things she would say very early on is: You know the little girl in the room you were born in died, and you have an opportunity. One of the things I remember is in that field we all played. We were not allowed to discriminate against anyone, because you know everyone falls on hard times. I think that was one of the greatest memories is we all played in that field together. Clearly with my feet the way they were I was not able to run like others. Was I made fun of? I don’t ever remember being made fun of. I had people ask why my feet were the way they were … I think in that field, if I hit the ball, I got on the base. You know I was a mother, and I have three children, and children don’t pick. You don’t pick what you get, and I was committed to being a good mother. They were not here to serve me. I was there to serve them. And that was always my priority … Through all these surgeries, I try to prep them, because I didn’t want them to be afraid of surgery. I didn’t want them to think their mother was going to die … With each surgery we tried to do something fun, so that they didn’t feel the weight of what was coming. [It’s] a three-day competition for newly injured veterans or those who’ve been living with disabilities and finally are thinking: Let me try to be active again. To try their hand at adaptive sports. Over the three days we do 11 adaptive sports. The conception behind it was really to get people active again after the recent war. I don’t discriminate. I don’t mind what your disability is, and we don’t care what color your skin is. If you are living with disability, we’re going to find a way to keep you active.